The Rolls RM69 MixMate 3 is a 6-channel stereo line mixer with 2 microphone inputs. The MixMate 3 is ideal for single-zone fixed installs where audio quality is a priority. 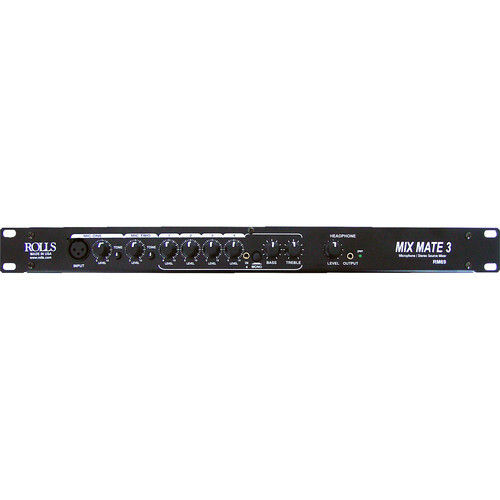 The MixMate 3 has four stereo RCA inputs for CD players, DVD audio, turntables, etc. The 4th RCA input has a paralleled 1/8" stereo input on the front panel for mp3 players. The 2-band EQ applies across all stereo inputs. The two microphone inputs each have a rotary tone control, attenuating lows in one direction and highs in the other. The 1st microphone channel has a paralleled XLR input on the front panel, allowing easy connection for a paging or karaoke mic. The front panel of the MixMate 3 also includes a 1/8" headphone jack with volume control and a global mono switch. 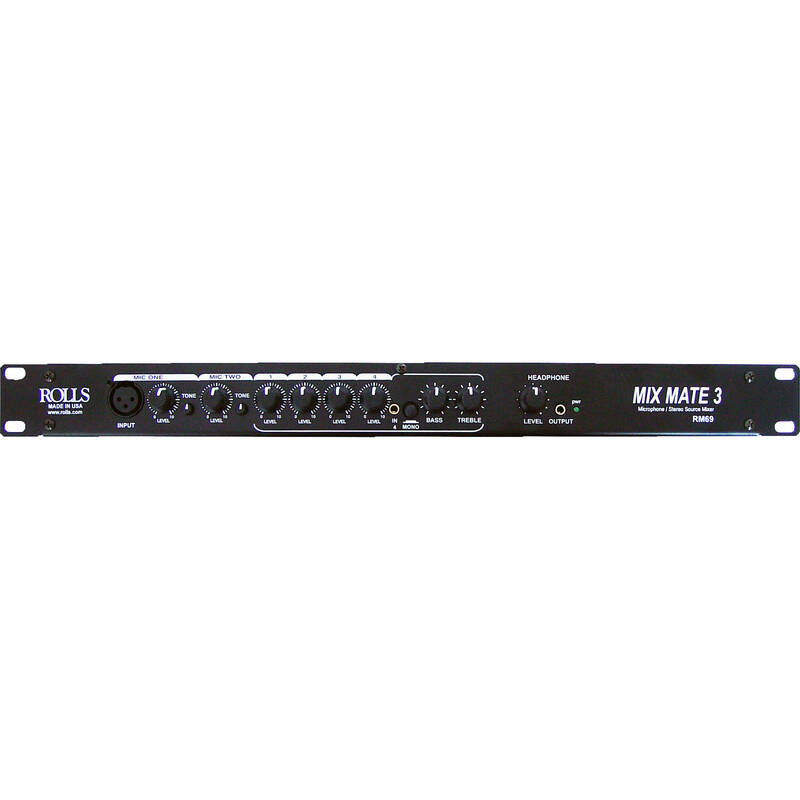 Box Dimensions (LxWxH) 21.6 x 8.0 x 3.8"
RM69 MixMate 3 - 6-Channel Stereo Line / Microphone Mixer is rated 4.3 out of 5 by 13. Rated 4 out of 5 by Mark Dean from Compact functional mixer Great mixer in a small size. I put it into a 2U case with a wireless mic receiver. I put a laptop on top, and have an instant mic/music setup. Versatile with the 2nd mic input, phantom power, and 4 line inputs. I also carry this as a backup to my DJ controller. Its compact size allows me to carry it to any show and have it on standby. And next week, I will use it as a 2nd system for music at the entrance to a cancer charity benefit. The only thing I didn't like was the wall wart power supply. I will make some kind of tension relief to secure the connector to the chassis to ensure it stays plugged in. But I am very satisfied with my purchase. Rated 5 out of 5 by Anonymous from I have purchased this product again Years ago I searched and searched for a single rack space mixer with XLR outputs to fit into a compact mobile DJ system. The Rolls RM69 was the perfect answer. More than enough audio inputs plus 2 mic inputs for a wired and wireless. The first mixer is still going strong without any issues. I only had to replace the external power supply. No big deal, they fail all the time - $13 at the local electronics store. I'm very grateful it was external so the unit didn't have to be sent out for service or opened up. Overall, a strong, versatile, compact mixer that packs a lot of punch in a very small footprint. Rated 1 out of 5 by Media Dan from Has distortion problem When I plug the unbalanced line out from a comsumer CD player into a source input I get distortion when the fader is turned past the 12 o-clock position. I had the same results when I used an ipod as the input. This is not good. Rated 5 out of 5 by Richard from Compact, solid, useful Great little rack mixer. Very solid, knobs are tight and have a sure feel. Not much range in the tone controls but enough to tame the edges. Really like the separate headphone volume, power LED, 120/240v power, and front mic input. Well thought out bit of kit that feels like it will last. Rated 5 out of 5 by rob from Great mixer! I bought this primarily for using it for a wired in ear set up.I'm a drummer so I don't need a wireless set up. The xlr input and headphone jack right on the front of the unit is super convenient. Works perfectly. Rated 5 out of 5 by James from Mix Mae I used the product for my outdoor movie screen and it works great. The items were delivered a day early and service was great. I will using B & H for all my audio needs in the future. Rated 5 out of 5 by John from Front Mic Mixer We needed a way to connect a front mic into a mixer that would allow some gain control for use with a remote IFB system. The RM69 works perfectly. Rated 5 out of 5 by DJ Beat from Perfect Solution I used the mixer in my DJ rig to integrate different gear, with the ability to use the Numark NS6 to control it all. Glad I found the device. IS THIS any good for singing karaoke? Technically, this would work for karaoke. It has 2 mic inputs and 4 line (RCA) inputs. With balanced (XLR) and unbalanced (RCA) outputs. It is a simple mixer with no effects, like reverb or pitch shift. But great audio quality. I love mine. I use it for hosting trivia and DJing community events, where my full mixer or DJ console are not needed.